To capture attention from CEOs, owners, and Boards as a CFO, you’ll need an achievement-driven, branded Resume and LinkedIn Profile, showing your impact as a strategic C-suite advisor. CFOs often serve as the growth driver and strategist for sound business decisions; your role in financial modeling, capital strategies, technology direction, and expansion must be presented in clear, crisp detail. Contact me for a no-obligation review of your career goals and present situation. I look forward to learning more about your needs. 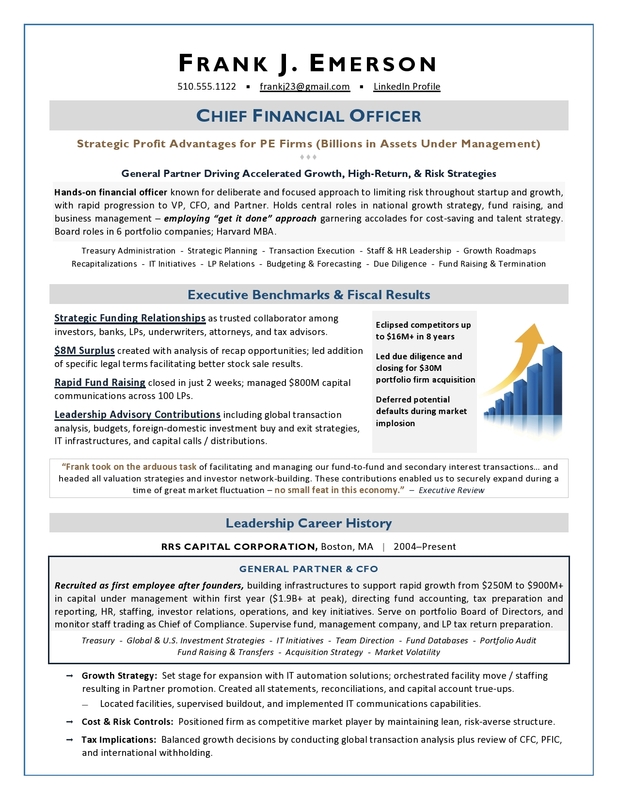 The first page of this real-life, interview-winning Private Equity CFO Resume sample is shown below. 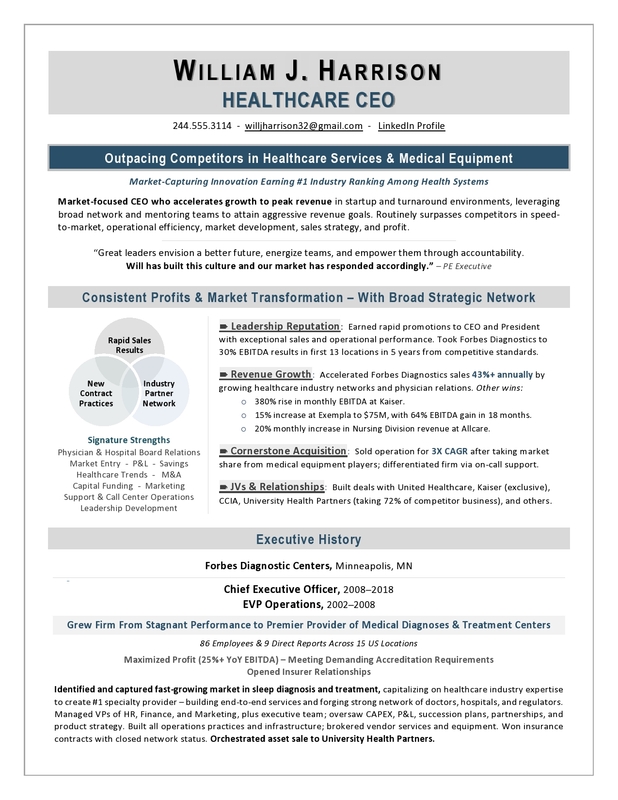 My clients (CFOs, CEOs, CIOs, CTOs, COOs, CPOs, EVPs, VPs, Directors) experience OUTSTANDING results and increased confidence as a result of my services. I know the qualities that employers seek – and many executives miss – that can make or break a hiring decision. 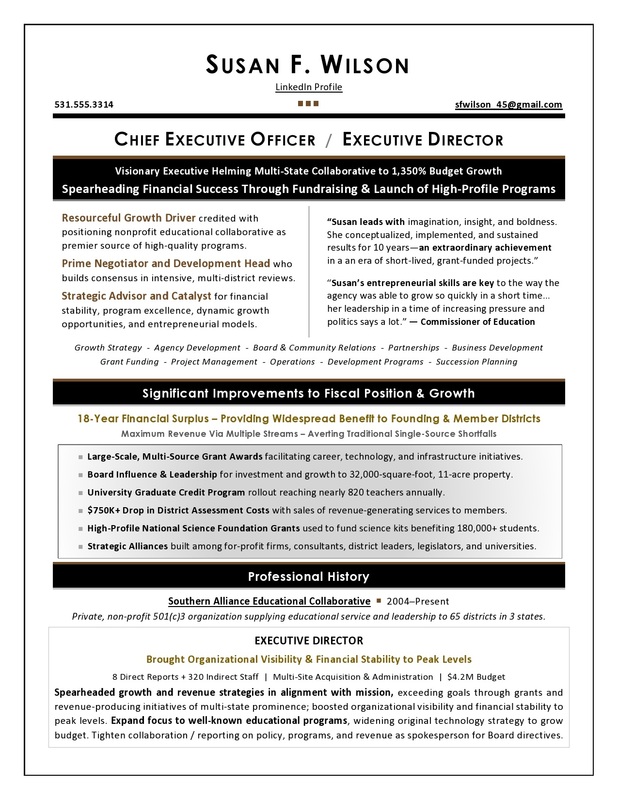 When you’re targeting a C-suite or rising executive position, you’ll need a trusted partner to ensure your message of value is communicated clearly and succinctly to Boards, owners, PE, CEOs, and other hiring authorities. Contact me to discuss your career situation in confidential detail. Laura Smith-Proulx, CCMC, CPRW, CIC, COPNS, TCCS, CPBA, CTTCC works with C-suite and rising executives to translate top career achievements to compelling resumes and LinkedIn Profiles – resulting in a faster job search and access to choice opportunitities.